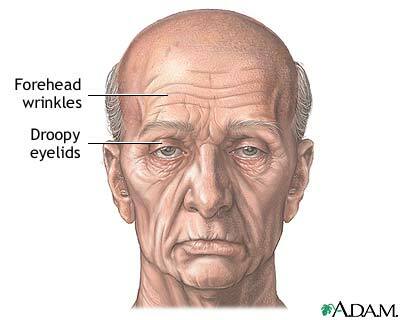 Forehead lifts are most commonly done for people in their 40s to 60s to slow the visible effects of aging. In younger people, a forehead lift can raise congenitally low eyebrows that give the face a sad expression. In people whose brows are so low that they interfere with the upper field of vision, the forehead lift can be performed as a reconstructive procedure. Deep furrows between the eyes also can be reduced through a forehead lift. Updated by: David A. Lickstein, MD, FACS, specializing in cosmetic and reconstructive plastic surgery, Palm Beach Gardens, FL. Review provided by VeriMed Healthcare Network. Also reviewed by David Zieve, MD, MHA, Medical Director, Brenda Conaway, Editorial Director, and the A.D.A.M. Editorial team.